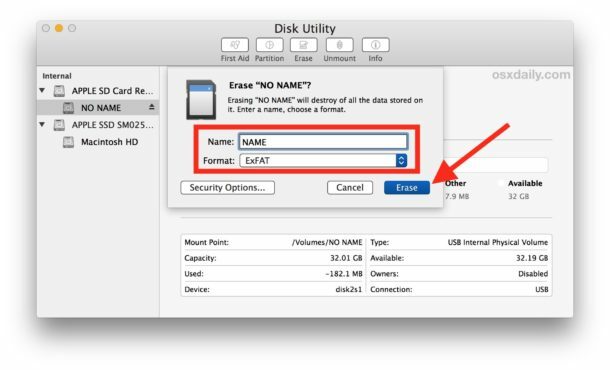 Formatting an SD card from a Mac is simple and quick thanks to the Disk Utility application. This is a commonly required task before an SD card or Micro SD card can be used as a storage medium for another electronic device, or even to remove any data stored on the SD card. 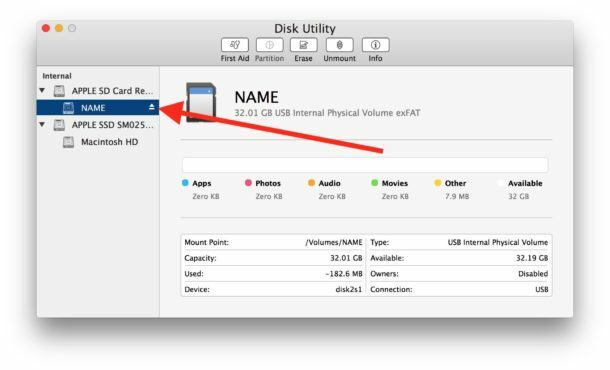 This tutorial will show you how to format an SD card or Micro SD card in MacOS with the Disk Utility app. Note that formatting an SD card or Micro SD card will erase all data on the card, as well as set a file system format for the SD card. Thus you will want to copy or backup any data on the SD card that you wish to preserve. If you’re aiming for maximum compatibility for use with most cross-platform devices, you’ll likely want to format to ExFAT, but you can also choose MacOS / OS X formats, or older FAT formats as well. Remember, this erases all data on the target SD card. Backup any important data before going further. Regardless of how you format the SD card or Micro SD card, when finished it will show as visible in the Disk Utility drive list, and in the Finder as well. Once formatting has completed you are free to use the SD card as you want, ready for use in another electronic device, or even if you wish to write an img or iso to the SD card for something like building a Raspberry Pi. In terms of choosing a file system format when formatting an SD card, it’s largely a matter of what the intended use is. 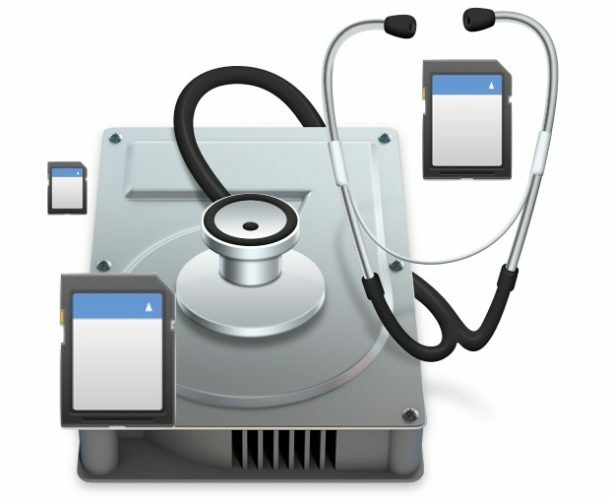 ExFat, FAT, and NTFS are generally broadly compatible and offer solutions for for both Mac and Windows PC compatibility, whereas selecting MacOS and OS X as the format are pretty much Mac compatible only. Most SD cards come pre-formatted as some variation of FAT, and ExFat generally works for what most electronic devices that use SD cards. You can also set security measures for the SD card if desired, but doing so would make it unreadable by something like a digital camera, Raspberry Pi, smartphone, security camera, or most other devices you might be aiming to use an SD card with. Thus while you’re free to encrypt the SD card like any other storage medium, it’s generally not recommended unless your intention is to keep it exclusively for Mac use and as an encrypted data storage device. 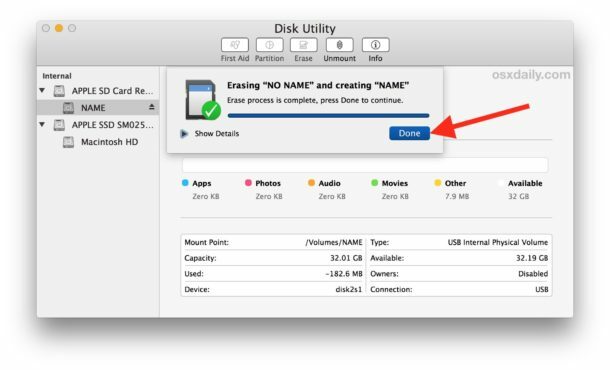 The approach covered here obviously focuses on formatting an SD card from Disk Utility in Mac OS, but if you’d rather use the Terminal for whatever reason than you can use diskutil to erase and format from the command line as well. * Many older Macs include an SD card reader, but most new model Macs do not have an SD card reader built-in, however you can get a USB SD card reader for around $12 on Amazon (or get a USB-C SD card reader if the Mac has only USB-C ports). Have a great Holiday season and Merry Christmas! Sometimes I can format them in a camera which pretty much doesn’t care what format was previously on the SD card, it will write over anything. But, sometimes nothing will remove the write protection from the device and allow me to re-format it. I’ve got about half a dozen of them laying around waiting for a solution. Interesting, never knew there was an SD Association! My personal experience is that SD cards are often best formatted by the device they are to be used by. You can format it with a Mac or PC if you want to use it as storage for a Mac or PC, or even for Linux, but if you’re putting an SD card into a camera or something then I always do the formatting on the device. I have a camera that has a 32GB SD card and if you format it with anything other than the built-in format within the camera settings, only 0.5gb shows up of the 32gb as usable, which I am not sure why that is, it is the same ‘format’ according to Disk tools. So if you feel like the SD card does not have enough space as it should, or not all space is recognized, try that. I’ve never had any luck using SD cards on my Macs. I had a late 2011 13″ MBP, and the SD card slot might as well have not been there (even after a full MoBo/internals swap). When I sold it in 2016, I got a late 2015 iMac 5K and its SD card slot doesn’t work, either! I don’t know if it’s a problem with the particular SD cards I’m using, or what, but it’s frustrating. …there’s a reason ALL camera manufacturers recommend formatting your SD cards in the camera you intend to use it in! It depends on the use case how you should format it. If you want to use it for something like a raspberry pi, you should use the official SD card formatter from the SD consortium. SD cards don’t have any kind of internal error checking so the official formatter will recognize any bad blocks and mark them as unusable. I usually format the card with the official software and then reformat in the camera for use there. If you’re going to use it as a storage medium for your Mac, I’d format it with the official software then reformat to a Mac file format in disk utility.